I am still full from Easter dinner. This is not a complaint—I know I overdid it, but I overdid it on a seemingly endless parade of lovingly, masterfully prepared foods, courtesy of my mom. The meal began shortly after 1pm with hot and cold antipasti: homemade salami (thanks to mom’s neighbors, Dominick and Rosa), olives, fried artichoke hearts with tomato sauce for dipping, fresh mozzarella, and a favorite from my childhood—spinach-ricotta triangles. These are a little like the Greek favorite, spanakopita, except my mom makes individual triangles of the phyllo dough (instead of a pie) filled with spinach and ricotta cheese (instead of feta). They are crisp, feather-light, and dangerously addictive. For the next course, pasta. But not just any pasta—this being Easter, my mother made raviolini. Some were filled with spinach and cheese, and some were filled with veal & pork. The raviolini were tossed in a tomato sauce, accompanied by sausage and meatballs (made in the classic tradition with veal, pork and beef, and very little breadcrumbs). After finishing the pasta, we took a breather. There were more raviolini and meatballs left on the stove, but was there room? Possibly. But the scent of the roasting eye-round from the oven was a reminder that more food was coming. A serving platter of sliced, pink roast beef arrived on the table in a few minutes, accompanied by a salad, gently dressed with olive oil and red wine vinegar. A perfect, clean finish. Well, “finish” might not be the right word. There was dessert to be had, but not until after a good stretch and a long walk. I helped my mother clear the table, and then my boyfriend, our friend Nat and I ambled around the quiet streets of Kenilworth, New Jersey, basking in the sun and rubbing our stomachs, praising the wonderful food we had eaten and wondering how we could possibly fit more in our bellies. When we returned to the house, we found two platters on the table, filled with the gorgeous, labor-intensive cookies I see in this house on specific holidays: rainbow cookies, brownies, amaretti, and the ones you see in the picture below—the ones my mom and I simply call “the lemon cookies”. These fluffy pillows of lemony goodness are my favorites. The cookies are baked, cooled, and then delicately covered with an icing made of lemon juice and powdered sugar. Simple, elegant, and delicious. I love these cookies so much that I don’t want the recipe for them. I don’t want to even try to make them and risk the chance of screwing up, or make them successfully and have the opportunity to take credit for them. These are cookies I love because my mother makes them for me. They are her art, a showcase of her skill, her talent, of how much love she puts into cooking and baking for the holidays. And every day. So thank you, Mom, for an amazing meal, a delightful afternoon, and for always welcoming my friends to your table. I can only hope that I make my guests feel as special as you do. 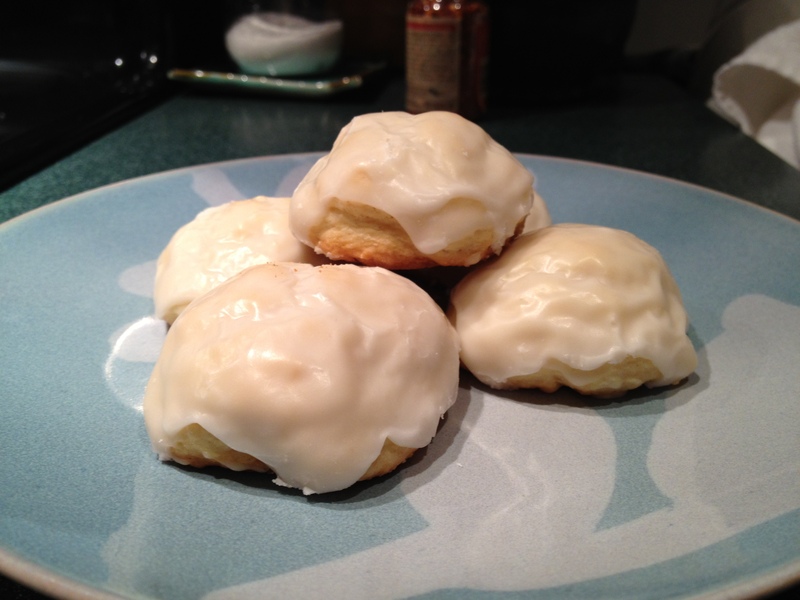 This entry was posted in Musings and tagged amaretti, cooking, easter, holidays, home cooking, lemon cookies, mom, photo. Bookmark the permalink. Will you be posting recipes of these dishes. I love lemon cookies, and those spinach triangles sound wonderful. Hi Casey! Thanks for your note. I’ll get the recipes from my mom and post this week. Stay tuned!